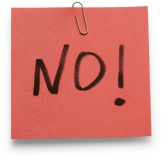 Coaching Tip: Nine Ways to Say "No"
Many people find it really hard say "no". And, as you probably know, some people are harder to say "no" to than others. But not saying "no" when you need to can absolutely ruin your life, so it's important to learn to do it right. Saying "no" is the first step in setting effective boundaries, which is a requirement for living a great life. When you have the tools you need to say "no", you can open the door do being, doing and having what you really want. However, depending on how hard it is for you to say "no", you may also need coaching in order to incorporate this skill into your life. I became a coach, in part, to master this skill and now it's one of my coaching specialties. I'm here to tell you that if you have a hard time saying "no", you're missing out on some of the best things in life, because you're not getting the chance to say "yes" to what you really want. That's one reason why hiring a masterful life or business coach is such a powerful game changer. Whether or not you've already hired your own coach, here are some tips on how to say "no" effectively to almost anyone, including family, friends, neighbors, and co-workers who nag, plead, bully, etc. You will need to practice them in order to master them. How much freer will your life be when you only say "yes" when you really mean it? The simple no. Do your best to say "no" with a neutral tone of voice. No edge, no charge. Simply say, "No", followed by no explanation. This is the most powerful way to say "no". A variation is: "I'm sorry, No." The key is to not offer an explanation. Explanations just invite arguments. The kinder no. Say, "I wish I could." (If necessary, follow with: "I understand. I wish I could.") This establishes that you're still a kind person, but you just can't. Again, no explanations. The preference no. Say, "I'd rather not." (If necessary, follow with: "I understand. I'd rather not.") This time, you're being clear that you have a preference and that preference is, "no". No need to explain it. The broken record no. If the other person argues, say, "Be that as it may, I can't." Repeat exactly this phrase and nothing else, until the other person runs out of arguments. Again, avoid engaging in any argument or explanation. This is known as the "broken record" response. The person that you repeat it to will run out of steam, eventually. The oh no. Just say, "Oh." This is useful if the other person tries to push your buttons, which is a common tactic of people who can't accept the word, "no." They most likely are upping the ante in order to engage you in an argument that they are used to winning. "Oh" is disarming, because it gives them nothing to argue with. Again, use a neutral tone of voice. Do your best to stay calm. The I'm not having a good time no. If the person you're saying "no" to persists, say, "I'm not having a good time and I'd like to end this conversation." If they still persist, say, "I'm not having a good time and I'm leaving." The stop no. If they still persist, "I'm asking you to stop." Stay calm. Next, "I'm requiring that you stop." Continue to stay calm. The traffic cop no. Finally, put your hand up, palm forward (think traffic cop) and repeat any of the steps above. This is extremely powerful. If good fences make good neighbors, then good boundaries make great relationships, great careers and great lives. Once you've mastered these nine ways to say "no", the energy vampires in your life will slink off to find other victims and the energy that you free up for your own life will be incredible. You'll also start attracting higher quality people. And paradoxically, you'll probably become a more giving person. Trust me on this. These nine ways to say, "No" will help you build effective boundaries within which you can create your best life. If you need a coach to help you, I still take a few clients. If you want to help others create fantastic lives and careers, join School of Coaching Mastery. Either way, it's okay to call me at 877-224-2780 to find out.